All About Learning is a company I have blogged about before. Mostly in relation to All About Spelling, as that was their primary product. I reviewed All About Spelling Levels 1 and 2, and I reviewed a couple of their readers - one from Level 1, one from Level 2. Print Awareness: this is basically understanding that text carries meaning. Phonological awareness: being able to hear and identify word parts -- taking a word apart and putting it back together again. This is the skill my older kids were missing when we began reading instruction. Letter knowledge: where most learn-to-read programs start -- recognizing letter shapes, knowing their names and knowing their sounds. This skill is, I think, the only one most people expect in "pre-reading." Listening comprehension: understanding what they hear from books. This helps with vocabulary, it helps with understanding a story, and it helps the child to absorb "book" types of language patterns, which are different from spoken language. Motivation to read: helping the child to want to learn to read. They maintain that all five of these skills are essential in preparing a child to learn to read, and they teach these skills through a combination of fun games, cute letter-based crafts, poetry, and even food. The first 26 lessons focus on knowing the capital letters: writing them, finding them, playing with them. They also focus on listening comprehension with letter poems for each letter from The Zigzag Zebra. There are print awareness activities with increasing difficulty. And there is a bunch of phonological awareness activities -- starting with rhyming (first 11 lessons, increasing difficulty), then working with segmenting (counting words in a sentence, putting syllables together, counting syllables, which word is longer, ending sounds, beginning sounds, and starting to blend sounds together into words). All along, you are also reading aloud 20 minutes a day. We are nearly through this section, and it has been FUN! Trina knows most of her capital letters, and the rhyming was pretty easy. But the rest of the phonological awareness activities have been a little more necessary for her. She has adored the little crafty letter activities, and the games have been fabulous. I don't tend to use the audio CD for the book, as the little letter poems are really short, so listening to the CD just isn't worth the time it takes to find the track. The next set of 26 lessons focus on knowing the lowercase letters, writing them, finding them, being lightly introduced to their sounds. Multiple words beginning with that letter are introduced. There is listening comprehension with poems about things starting with that letter, from the book Lizard Lou. (This book is fabulous.) There is a focus on motivation to learn to read. And a bunch of phonological activities. Beginning sounds, which word is longer, blending together, ending sounds, then a whole string of starting sounds games, a few ending sounds games, and finally listening for long vowel sounds. And you continue to read aloud to your child. The final set of 26 lessons is intended to INTRODUCE a single letter sound. Each lesson is incredibly similar... introduce the sound, look through either the book we did in the first section or the book we did in the second section, naming everything we see in the illustrations, then identifying things that start with the letter. There is a sound match worksheet. Play a 'what am I?" riddle game. Eat stuff that begins with the letter. Read aloud. One thing I have loved about All About Spelling is that it is so gentle and incremental, really focusing on all the important (and often relatively invisible) basic skills necessary to be able to spell. All About Reading follows that tradition, and this Pre-1 Level is not going to TEACH your child to read. But it is going to build the foundation that will make learning to read so much easier, and so much more fun. As you work through the program, there are notes to the teacher scattered throughout that give fantastic tips on the value of reading aloud and specific things you can do as you read aloud. I'll confess, very few of these were helpful to me, but they would have been wonderful when my oldest was five. The best part is that they are fed to you a little piece at a time, instead of a big long article on all the things you ought to be doing. Every two or three lessons, there is one little tip. So it is gentle and incremental for teaching the teacher too. I have to say that one thing I appreciate more now than I did when I started is the value in programs that teach ME about teaching. You can visit All About Reading for two free activity books to check it out for yourself. And samples are also available on the order page. Though I have to confess that the samples really didn't do a lot for helping me to see the value in this program. Level Pre-1 is available as a basic package ($79.95) which includes everything you need to teach one student, or a Deluxe package ($119.95). 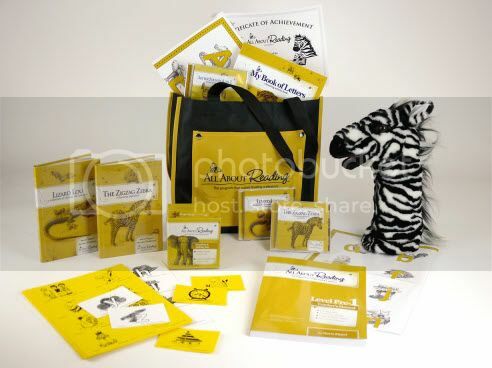 The Deluxe package includes the Zebra puppet (which is even more adorable in person than in the above picture), the tote bag, and the activity card box. You can also purchase the consumables separately if you are planning to use this with more than one student. If I were purchasing this program, I'd be buying the basic package, using a cheap 3x5" card box from Walmart, and dreaming about how much Trina would adore the zebra puppet. I think I'd be missing out though, as the puppet really does add a lot to Trina's interest in the program, and she is willing to "teach" the zebra in a way that she wouldn't do with out me. All About Reading Level 1 will go along with All About Spelling Level 1, and is expected out in June or July, according to intel on their forum, The ChatterBee. Disclaimer: As part of the TOS Homeschool Review Crew, I did receive All About Reading Level Pre-1 from All About Learning. The fact that I received complimentary products does not guarantee a favorable review. It does guarantee a review. A fair review. But I am not going to praise something unless I think it deserves the praise. If I don't like it, you'll hear that. And hopefully with enough detail as to why so you can decide for yourself if what I hate about it makes it perfect for your family. For more about my take on reviews, visit my blog post here. Great review, Debra. You did a great job talking about the entire program and all sections of the materials. We only just made it into the lower case section of the materials, so I focused on the sections we had worked with.